In the severe deflation of the Gilded Age (1870s to 1890s), workers were grateful for any work, and the long hours (11 to 12 hours on weekdays, plus half a day on Saturday) were not so different from those experienced on the farm. But between 1900 and 1920, people's attitudes toward mills began to change, as did conditions in which the mills operated. Most mills were controlled by major stockholders, including absentee shareholders, rather than the local community; consequently, workers felt less beholden to the owners. In addition, by about the 1920s changes in the style of women's apparel had reduced the amount of cloth needed for its manufacture. More important, competition from Europe, now recovering from World War I, and from new mills in Japan increased pressure on owners to keep wages down. Ironically, the number of textile mills in North Carolina was increasing as New England factories, hurt even more by imports, moved mills south to take advantage of the state's prevailing low wages. Labor strife was inevitable. Major strikes erupted at Charlotte in 1919 and Gastonia in 1929, and a 22-day statewide general strike was staged in 1934. On the eve of the Great Depression, industrial workers in North Carolina totaled 209,000. The Great Depression-which began in 1929, reached its nadir in 1933, and endured until 1941-affected all North Carolina industries. The New Deal of Franklin D. Roosevelt's administration halted the decline, but not before many factories had scaled back or failed altogether. Government programs seemed unable to restore the situation to even the levels of 1929. For those workers who still held jobs, however, New Deal legislation brought a reduced work week with a minimum wage as well as an end to child labor (once 24 percent of the textile industry workforce plus a large portion of that of the tobacco industry). But it took World War II to restore the nation's industrial economy. World War II brought $2 billion in federal military contracts to North Carolina. Most went to shipyards in Elizabeth City, New Bern, and Wilmington, where submarine chasers, minesweepers, and Liberty ships were built and launched. 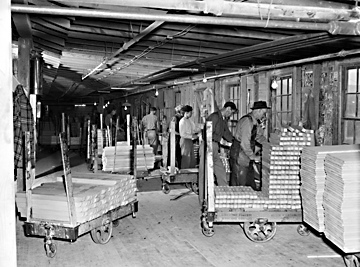 Other industries boosted by wartime spending included the manufacture of ammunition and radar components. Traditional industries such as textiles and lumber returned to prosperity. Jennings Furniture Company, Lenoir, NC (Caldwell County); assembling and crating bedroom furniture, 1940s, photo by Patrick. From North Carolina Conservation and Development Department, Travel and Tourism Division photo files, North Carolina State Archives, call #: ConDev3192C. Available from http://www.flickr.com/photos/north-carolina-state-archives/2731989613/ (accessed October 2, 2012).